"The Devil doesn't have to hide. 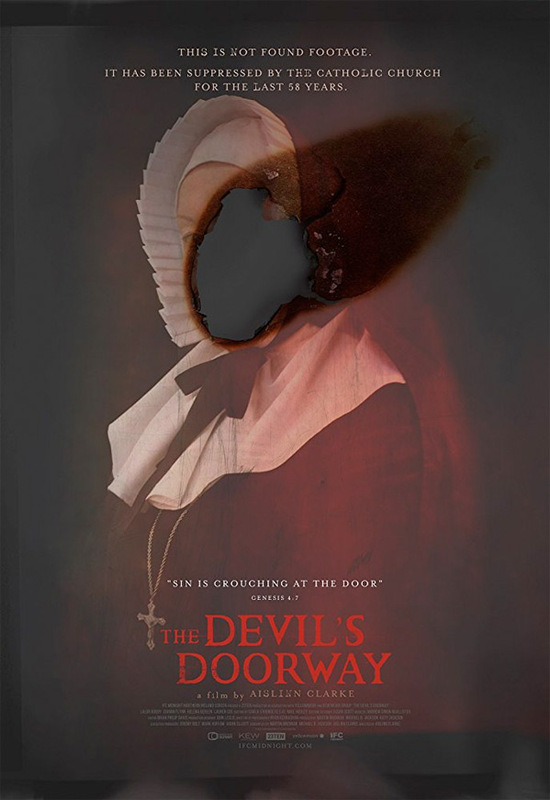 He roams freely amongst us…" IFC Midnight has debuted an official trailer for an Irish horror film titled The Devil's Doorway, which played at the Seattle Film Festival earlier this summer. The film is the feature directorial debut of Aislinn Clarke, and tells the story of two priests who uncover something horrific. In 1960, Father Riley and Father Thornton are sent to investigate a miracle in an Irish home for unwed mothers only to discover that one of the residents is possessed by the devil. The cast of The Devil's Doorway includes Lalor Roddy, Ciaran Flynn, Helena Bereen, and Lauren Coe. The grainy 8mm cinematography style is spooky, but I'm not sure there's anything more to this film than any other possession / exorcism horror before it. If this kind of horror is your thing, then take a look below. In the fall of 1960, Father Thomas Riley (Lalor Roddy) and Father John Thornton (Ciaran Flynn) were sent by the Vatican to investigate a miraculous event in an Irish home for 'fallen women', only to uncover something much more horrific. The Devil's Doorway is directed by Irish filmmaker Aislinn Clarke, making her feature directorial debut after a few other short films previously. You can follow her on Twitter @AislinnClarke. The screenplay is written by Martin Brennan, Aislinn Clarke, and Michael B. Jackson. This first premiered at the Seattle Film Festival earlier in the summer. IFC Midnight will release Clarke's The Devil's Doorway in select theaters + on VOD starting July 13th this summer. Who's interested in this film?